The essence of oceanfront in this one bedroom, renovated, second floor unit in the 'front row'. We have maintained the Mexican influence in our remodeling efforts. 100 yards from high tide on the Pacific Ocean with an unobstructed view from all rooms. Second floor affords complete privacy and security with the blind and sliders open, a view of sunrise and sunset, fishing boats, yachts, cruise ships, and whales from any room in the unit. Hear, smell and see the ocean because you don't have to pull the blinds for privacy, the case with first floor units. There is a blackout curtain in the bedroom so you can sleep through sunrise. Fishing dock is minutes away, as well as permanent flea market, harbor, downtown shopping, excellent selection of restaurants, and crazy nightlife. Terrasol units are privately owned, not a time share or hotel setting, providing an environment for a quiet, romantic and relaxing experience. We have owned this unit since 1996, and continually upgrade every year, and make sure you have ample paper goods, condiments, new linens and new furniture. Our nightly fee is less than comparable units in the 'front row', and on the second floor with high ceilings. When you walk into this unit, the response is 'Wow". The view is only in units in the 'front row', and breathtaking. High end King bed, stainless steel appliances, granite counters, Mexican appointments, newly renovated bath, a 47" flatscreen TV with 100 channels and a plethora of music options, and WIFI as well as hard wired internet. Kitchen is extremely well equipped with everything you need to cook your own meals if you choose to. We have two blowup twin mattresses for additional sleeping space. You can't get any closer than our condo to the sand and water. Just 150 feet from low tide. Our condo has views from every window of the oceanfront. Additional $5.00 fee per day for parking. This was a hard one to rate for us..... As other reviewers have said, the view is beautiful and the convenient location to the marina is great. We enjoyed being able to walk to the loco part of Cabo but then come back to a nice, quiet beach or pool to chill. The condo complex is very sedate which is just what we like. The condo itself is set up with everything one could want. We didn't turn on the A/C or the TV so don't know if they worked but we didn't need either. We didn't mind that the decor is a little dated but we did mind a few housekeeping/maintenance issues and that is what knocked our rating down. Perfect oceanfront location! I would have given this condo 5 stars if only everything had worked. The dishwasher was inoperable and the air conditioning in the living room didn’t work. The bathtub wouldn’t drain well unless I wanted to take a bath and then it wouldn’t hold water. LOL. We had a great time anyway! So glad to hear that you both had a great time, and we have contacted Terrasol again regarding the dishwasher. We contacted them, and thank you for the heads up, as we were under the impression that the dishwasher had been replaced. The other two maintanence issues have also been brought to their attention, and we really do appreciate being told about anything that isn't working properly. I am saddened that you didn't bring these things to the attention of the front desk during your stay, so that they could have been rectified. Thanks for being our guests, and we truly appreciate knowing about any element of our unit that needs attention. If the objective is relaxation and privacy, then this is the right place. There is no better location on this private beach. There's almost as many whales and baby turtles as people. Resort pools and beach front are steps away. Lie on the beach or 2nd floor patio, the breakers are the same. To the marina shops and restaurants, 3 minutes to lodge gates and 3 more to marina. If the objective is party scene or completely remodeled unit, then this is not the right place. Our second time being lucky enough to stay in this beautiful oceanfront condo. Located on a pristine almost private beach but only a 10 minute walk to the marina and all the action, truly the best of both worlds. Condo itself is very nice with everything we needed and the new wifi was plenty fast. Pool #1 with a swim-up bar and restaurant is 22 steps from the bottom of the stairs. Pool #2 is 31 steps in the other direction. Great place and a great trip. Hope to be back soon! Million Dollar View! Great Condo! 16 days in paradise! We watched the whales daily and had a front row seat overlooking the Pacific Ocean! Literally steps to the sand, ocean, pools and Palapa Bar/Restaurant. Terrasol is a beautiful Resort on a private beach and Unit #233 is right up front. We will stay there again next year! From the property manager to all the staff, we thank you for your top notch service! Use the Prickly Pear for grocery delivery so your groceries will be waiting for you when you get there. A great service to have available. We are so happy that you enjoyed your stay! We love our 'Million Dollar" View! It is a pleasure to receive such a great review from our guests. Please share your experience with your friends! Outstanding Location with Incredible View! We just spent a week at this condo. What a great location and the view was amazing! Terrasol Resort is a very pretty place with beautifully manicured grounds and friendly, welcoming staff. The location of this condo within Terrasol is by far the best location. Front row building, second floor (which is the top floor) with an unobstructed view of the ocean! We left the slider doors open day and night to hear the wonderful sounds of the waves crashing along the shore. Very quiet, uncrowded beach too with no vendors. Never saw more than 20 people or so on the beach on any given day. Saw a lot of whale activity right from the balcony. Amazing! Also plenty of bird activity too, especially pelicans in the evenings. Great location for viewing sunrises and sunsets. It was also nice and relaxing just watching all the boating activity as well. The food at the palapa bar is very good too, better than I was expecting. I already miss those pancakes for breakfast. They are a must! Very unique and delicious. We loved the condo and the quiet location so much that we ended up not doing as much in town as we had originally planned. But if you want to go to town, it is only about a 10 minute walk. Very convenient. 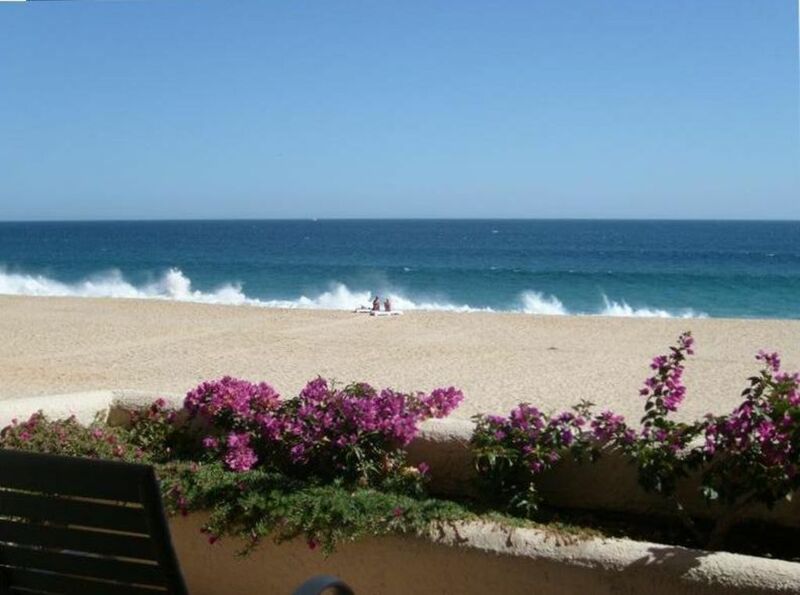 If you want a nice, clean condo with Mexican flair right on the beach with incredible views and in a quiet location away from the crowds of downtown Cabo/Medano Beach area then look no further. This is the place! We highly recommend this condo! Whale watching, Sportfishing, excellent dining, and crazy nightlife. The ocean ambiance cannot be enjoyed in a unit that isn't right on the ocean as this one is. You have a non-stop visual of all the ocean activity, can leave your sliders open and unlocked at night, giving you a sense of the ocean that is not felt in other locations.